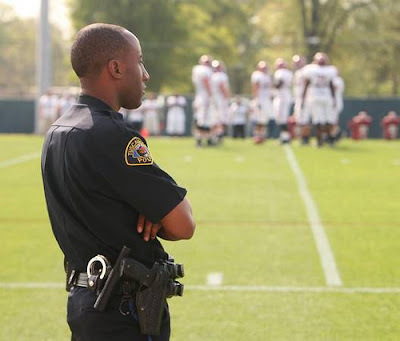 What is this uniformed Tuscaloosa police officer doing at Bama's spring practice? Is the TPD beefing up patrols in high crime areas? Is this the court appointed team parole officer? Are they filming another remake of "The Longest Yard?" Too bad they didn't get a picture of him in his vintage Bo Jackson jersey. no its just security. we're not as fortunate as that cow college on the other side of the state where they have livestock to keep out the intruders. This picture is concrete proof of the racial profiling conducted by T-town PD on the strip. More "Far East" than "Deep South"